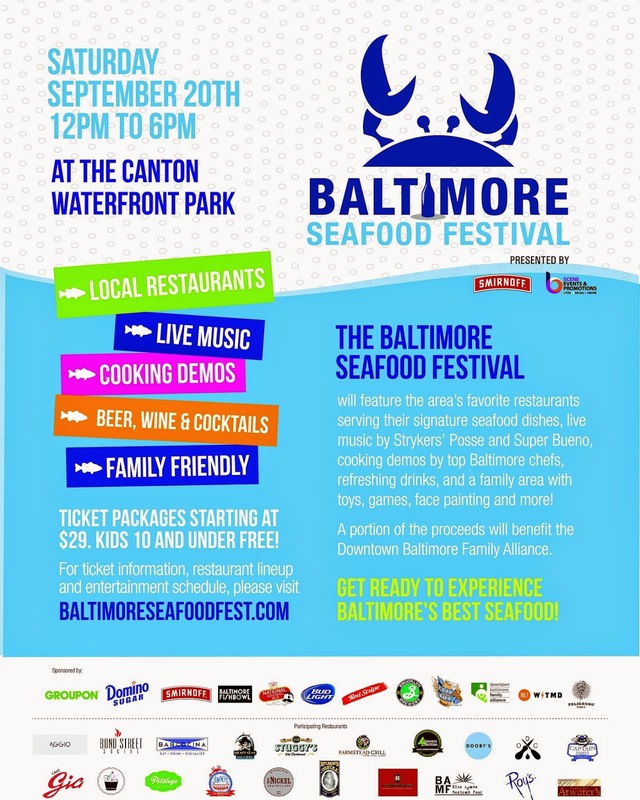 Before we say adios to summer, when the weather is just starting to be kissed by autumn’s cool breezes bring the family to Canton Waterfront Park for the Inaugural Baltimore Seafood Fest Saturday, September 20 from 12 pm to 6 pm. 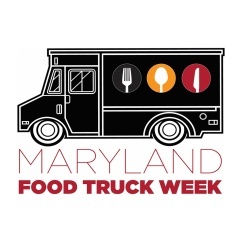 Live music, cooking demonstrations, oyster and crab eating contests, family area, crab feast tent and signature seafood dishes by your favorite Baltimore restaurants. I don’t know about you but I’m all in for the oyster eating contest, where do I sign up. Seriously, Baltimore’s Seafood Fest is a great way to enjoy a Saturday afternoon at the waterfront munching Baltimore chefs' culinary interpretations of the Chesapeake Bay’s bounty and sipping refreshing libations. Experience Baltimore’s best seafood at the Baltimore Seafood Festival with offerings from: Aggio, Bond Street Social, Barcocina, Langermanns, Café Gia, Farmstead Grill, Heavy Seas Alehouse, Ryleigh’s Oyster, Captain James Landing, Jimmy’s Famous Seafood, Blue Agave, Stuggy’s, Lebanese Taverna, Roy’s, Atwater’s, The Nickel Taphouse, Dooby’s, Dylan’s Oyster Cellar, Pitango, and Flavor Cupcakery. Baltimore Seafood Festival guests will enjoy live music by Strykers’ Posse and Super Bueno, Smirnoff Crush Bar, Peligroso Tequila Bar, Wine Bar, the Groupon Cooking Tent featuring cooking demos by Baltimore’s top chefs, local artists, and a family zone with kid-friendly attractions. The event will also feature a VIP area as well as a Domino Sugar Crab Feast Tent, featuring private tables for groups with bushel of crabs, private bars and cocktail servers. The Groupon Cooking Tent lineup includes: Scott Hines (Heavy Seas Alehouse), Bryan Voltaggio (Volt & Aggio), Joseph Cotton (National Aquarium), Jerry Pellegrino (Waterfront Kitchen), Tim Dyson (Dooby’s), Jessica Formicola (food blogger, recipe developer and food critic for Savory Experiments and Baltimore Foodie), and Gianfranco Fracassetti (Café Gia). Guests will enjoy complimentary cooking demos from Bryan Voltaggio’s Squid Ink Pasta dish with blue crab, jalapeno, and Old Bay to the history of Eastern Shore cuisine with Tim Dyson. A portion of the proceeds will benefit the Downtown Baltimore Family Alliance, a local non-profit whose mission is to make downtown Baltimore a place where families can thrive. 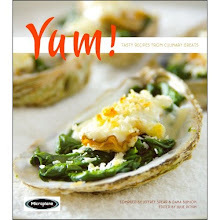 How to be entered to win a pair of tickets to Baltimore Seafood Fest is simple. Share this story on Facebook and/or Twitter with the hashtag #BmoreCfoodFest. The winner will be chosen this Friday September 12th. It’s that simple. Tickets packages start at $29 per person – kids 10 and under are Free. Baltimore Seafood Festival- Food and Drink Package - $29 in advance ($35 at the door if available): Includes general admission, a souvenir glass, swag bag, two drink tickets for beer, wine, cocktails or non-alcoholic beverages, and 10 tickets to use towards food items (items will be priced between $1 and $7 depending on the restaurant and item). Additional tickets for food and beverages may be purchased at the event $1=1 ticket. Kids 10 and under are FREE with a paying adult. Purchase now! B'more Crabby Ticket - $59 (will not be available at the door): Includes general admission, a souvenir glass, swag bag, a half dozen premium male crabs, three drink tickets for beer, wine, cocktails or non-alcoholic beverages, 10 tickets to be used towards food items (items will be priced between $1 and $7 depending on the restaurant and item), and community seating in the Crab Cove area. Kids 10 and under are FREE and may enter with an adult as long as the adult has a B'more Crabby ticket, but chairs are designated for paying adults. Purchase now! Private Crab Table - $750 (will not be available at the door): Includes general admission for up to 10 people, 10 souvenir glasses, 10 swag bags, one private table in the Crab Fest tent with a private bar and cocktail server, unlimited drinks including beer, wine, cocktails and non-alcoholic beverages, a bushel of crabs and sides, and 100 tickets to use towards food items (items will be priced between $1 and $7 depending on the restaurant and item). Please note that kids 10 and under are free, but space is limited and only 10 chairs per table. Purchase now! VIP Ticket - $75 (will not be available at the door): Includes general admission, a souvenir glass, swag bag, entrance to the VIP tent with a private bar, unlimited drinks, light fare, and 15 tickets to be used towards food items (items will be priced between $1 and $7 depending on the restaurant and item). Purchase now! Kids Meal & Activity Package - $11 (will not be available at the door): Includes a catered boxed lunch (choice of PB&J or Turkey & Cheese, Chips, Fruit and a juice box), a "kiddie swag bag" with fish bubbles and a beach ball + an activity pass which will includes a sand art station, bracelet making station, temporary tattoo station, and crab hat station. Kids 10 and under are FREE to enter the event. This package is just an option for families. Tickets must be purchased by 9/17/14. Purchase now!